It is grand indeed. Hullmark Centre. 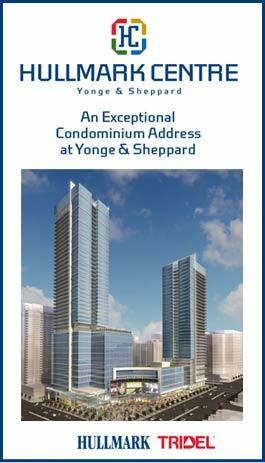 A signature development at the corner of Yonge and Sheppard marked by a prestige office component, prime retail fronting onto a vibrant public plaza, and the two tallest condominium towers to grace the North York skyline. Served by direct indoor underground access to the Yonge and Sheppard subway station, this is the most important corner and address in the city. It is undeniably central. It is undeniably central. Served by direct indoor access to the Yonge and Sheppard subway stations, this is the most important corner and address in North York - a destination, a hub and a meeting place destined to become a defining landmark. Hullmark and Tridel - two of the most respected developers in Canada - have come together to create an unprecedented Built Green. Built for Life™ mixed-use development whose master plan is truly visionary, and a grand testament to all that life in the city can be. Contact me today to receive further updates on Hullmark Centre and be placed on an exclusive list to preview and purchase before we open to the general public.